While the group stage of the IIHF 2014 Ice Hockey World Championship in Belarus is finished, the most interesting play-off matches, including the finals, are right around the corner. This is a great opportunity to visit Minsk which has already welcomed more than 17 thousand tourists from EU countries who have benefited from the visa-free regime. Some guests have managed to visit interesting places outside of Minsk, such as the magnificent Mir and Niasvizh castles. But Minsk itself, with its moderate prices and Soviet-style charm, is increasingly becoming an enjoyable destination. This short guide provides some tips how to spend a nice day in the capital of Belarus. Enjoying a tasty breakfast is a prerequisite for a fulfilling day full of adventures. News Café and My English Grandmother are ideally suited for this purpose, though coffee and tea lovers will also enjoy places like Coffeeberry, London, Guru or La Crête d'Or – all of which are located near Lenina street. Then go on to visit the National Art Museum located in the same area to see masterpieces by famous Belarusian and Russian painters. During the ice hockey championship, the museum is also presenting the paintings of world-renowned Belarus-born Chaim Soutine and Marc Chagall as well as a collection of Medieval Belarusian books and luxurious Slutsk belts. After the exhibition, experience Soviet-style shopping at GUM and TSUM or buy ceramic and linen souvenirs in special shops on Freedom Square and Independence Avenue. If you are hungry after visiting the museum and doing a bit of shopping, visit a café to enjoy very nutritious Belarusian food. Restaurants like Kamyanitsa and Stary Gorad offer a variety of traditional Belarusian dishes such as draniki (small fried potato pancakes), machanka (a meat dish usually eaten with pancakes), Kvass and the alcoholic drink Krambambula. A hearty meal will greatly energise you for the walk from Independence Square to Victory Square along the Independence Avenue. The UNESCO World Heritage Tentative List notes the Avenue as the only place in the world where the Stalin's Empire style has survived in complete ensemble form. Enjoy fresh air, a catamaran trip or cycling at Park Horkaga and Park Yanki Kupaly that provide a green perimeter around the central part of Minsk. Then take the metro to visit the 74-meter tall National Library shaped as a rhomb-cube-octahedron. As one of the most unusual buildings in Eastern Europe, it has an observation deck overlooking Minsk. In the evening go back to the centre to visit Niamiha – the oldest part of the city that was first mentioned in 1067 in connection with the battle between the forces of Kievan Rus’ and the Principality of Polatsk. Just five minutes away from the Niamiha metro station, the Trinity Hill/Banlieu overlooks the Svislach River with mostly 19th-century buildings. Then visit the Island of Tears (Vostrau Slioz) nearby that commemorates all Belarusian soldiers who have been killed abroad, though it focuses primarily on those who served the Soviet war in Afghanistan. Continue your walk to the Upper Town, making a short stop at the Baroque Peter and Paul Church (6:40 pm) – the oldest survived stone building in Minsk (1612). The Upper Town was the centre of commercial, cultural and religious life before the Russian revolution. It includes Freedom Square and Minsk City Hall – a former symbol of self-government rights. Regardless of your religious views, it is worth taking a visit to either the Roman Catholic archcathedral church of Blessed Virgin Mary (18th century) or the main Orthodox Holy Spirit Cathedral (17th century). These beautiful buildings survived many years of wars and anti-religious campaigns during the Soviet era. After a short promenade around the area, choose a restaurant for dinner. The Upper Town and the neighbouring area are home to arguably some of the best cafes and restaurants in the city, including the Spanish-style Tapas Bar (great for quesadillas, paellas and red wine), Bistro de Luxe, Times Café, Boulevard, and Grand Café located in a splendid Stalin's Empire style building. Reserve places in advance to avoid queues and a lack of free tables, especially in the evening. After dinner, take an evening tour around the city. 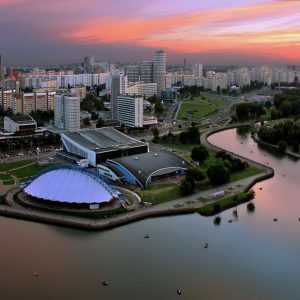 In contrast to some of its neighbouring capitals, Minsk is well-known for its safety and cleanness. The city has a special charm after sunset, so experience it by travelling down Independence Avenue and Karla Marksa street which looks like a place you could find somewhere in Paris. In apparently trying to continue with the French motif, the authorities of Minsk made many buildings in the centre beautifully illuminated in a manner that resembles Lyon. Having grown a bit tired after a promenade, consider having a pint of beer in some of Minsk's famous pubs. According to JK Rowling's Harry Potter and the Order of the Phoenix, even the half-giant Rubeus Hagrid himself had a disagreement with a vampire in these pubs. The Upper Town is a very appealing place as it has increasingly become the centre of Minsk's nightlife. It includes a diverse range of cafes from Czech-style Staramesny Pivavar with its own brewery to the more stylish Bessonica (Insomnia) or the lively Cherdak (Attic) with parties. Most of them work until at least 2 am. Alternatively, consider visiting the bar Sweet and Sour or night clubs such as Blondes and Brunettes, Robinson, Re:Public, Dozari or Madison before heading back to your hotel. Despite the stereotypes about the "Sovietness" of Minsk, it contains many cosmopolitan places which combine high quality service with a regional uniqueness. Many foreigners from Western countries find the city unusual and note that the list of its merits extends well beyond its cleanness and safety. 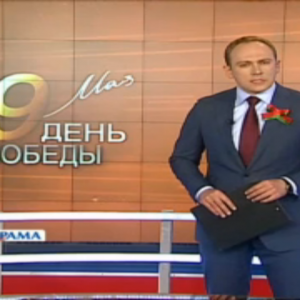 The Ice Hockey World Championship have dominated the news coverage on Belarus' Channel 1. Journalists regularly report on the games, but also praise the event's organisation. The official celebrations carried out on Victory Day, held annually on 9 May, were another popular topic. The Belarusian head of state answered questions from journalists during the commerative event, including questions about the Eurasian Union and combating corruption. Journalists also regularly covered the current developments in Ukraine. While commenting on the referendum in Donetsk and Lugansk, one journalist remarked that Western and Russian observers have ignored it. Western Military Forces to Stay in Estonia? ‘Spring storm’ with its 6,000 officers, NATO military drills, was recently launched in Estonia. The military exercises take place in areas close to the border with Russia, notes the report. Poland and Denmark have sent their own fighter jets over Estonian airspace to protect it. After the drills, an American command will remain in Estonia until the end of the year, he concluded. ‘A Symbolic Meeting in Moscow’… a day before Victory Day. The coverage noted that Victory Day remains a sacred anniversary for every former soviet republic. "60 years ago [we stood] together against fascism, today again together we deal with [new] challenges and threats", the reporter states, commenting on the meeting of five leaders of the CIS countries in Moscow. The heads of states of Russia, Belarus, Kyrgyzstan, Tajikistan and Armenia gathered in Moscow to discuss security issues, but also in preparation for the Eurasian Economic Union Agreement that is soon expected to be signed. Belarusian state TV showed President Vladimir Putin stating that "from time to time nationalism rises here and there" and commented that the case of Ukraine showed the consequences of irresponsibly conducted politics. Alexander Lukashenka criticised those who diminish the importance of the Soviet nation. Lukashenka and Putin discussed also the developments taking place in Ukraine, but also how to challenge sanctions together. Commemoration of Victory Day in Ukraine. Reporting on Kyiv, state TV noted that this year there was no traditional Victory Day parade in the country. The report continues on to state that tension can be felt in the air. The state authorities placed flowers on the main Tomb of the Unknown Soldier momenment and a special service took place throughout the nation's churches. Only Donetsk held a parade with war veterans that proceeded through the city. Referendum in Donetsk and Lugansk. State TV reports that the Ukrainian authorities did not recognise the results of the referendum. The authorities also argued that fewer people took part in the elections in reality as the supporters of federalisation claim. In the opinion of journalist covering the story, it is impossible to confirm its results as "both foreign and Russian observers have ignored the referendum". The coverage also points out that according to the Ukrainian Constitution the status of particular regions cannot be decided by a local referendum alone. "Nevertheless, the Ukrainian authorities once again have announced their readiness to conduct a dialogue with the east", the report continues. Sergey Lavrov, the Russian Minister for Foreign Affairs, argues that Kiev should start talks with the Donbas. Is Ukraine on the Brink of the Civil War? Journalists cited the French Minister for Foreign Affairs, Laurent Fabius. In his opinion to solve the conflict in Ukraine, it is necessary for Russia, European Union, US and Kyiv to all be involved in the negotiation process. At the same time, the International Monetary Fund stated that the Ukrainian economy had the worst economic indicators when compared to its neighbouring Eastern European countries. Over the last 20 years the GDP of Ukraine has not seen noticeable growth. The IMF expects that Kyiv will immediately change its economic policies and increase its prices for electricity and utilities. Victory Day: Lukashenka Speaks to Reporters. After the official part of the celebrations had concluded, the head of the Belarusian state answered questions from Russian and Belarusian journalists. Were all the controversial issues regarding the Eurasian Union resolved? Lukashenka emphasised that all sides had reached agreement on all the outstanding issues. Where there were still controversial issues where disagreements existed, bilateral agreements were reached. Will the sanctions on Russia have implications on Belarus' economy? Lukashenka pointed out that the countries should be mobilised and react to the sanctions by increased production on their internal markets. "First of all, we should move production to our own companies, pay them well for their work and live as well as Germany", he stated enthusiastically. "Then nobody will talk about economic sanctions. We will be self-sufficient", he continued. Has the head of state already started a political campaign or is his combat on corruption an honest act? Lukashenka replied that he started his electoral campaign already back in December 2010 after he won presidential elections. The problem of corruption remains valid today and requires attention from the state. He continued by explaining the governments recent struggles with increased levels of bribery. "If you will not vote for me…" "I will not be offended", he stated. The person who would replace him, should not, however, go about destroying what has already been established. The Belarusian Parliament. Several laws were recently passed in the Parliament. One of them is an amnesty law that was announced in connection with the 70th anniversary of Belarus' liberation from the German-fascist occupiers. The amnesty law is proof the humanitarian nature of the Belarusian state according to the reporter providing the coverage. Further, they mentioned that around 2,700 prisoners who have proven they are rehabilitated will be released on this occasion. Amnesty will include the under-aged, pregnant women, pensioners and the disabled, provided that they did not commit any serious crimes. Belarusian MPs have also passed a law on ‘Belarusians Living Abroad’, which seeks to embrace 3.5m members of the Belarusian diaspora. The law envisages means of getting support for various activities in the spheres of culture, education, and tourism. Talk Show on ONT ‘Pozicija’ The central issue discussed in the course of the programme was Belarusian hospitality and the attractiveness of Minsk to foreigners arriving to watch the World Ice Hockey Championships. Among the programme's guests were the representatives of the police, a Belarusian movie director, Russian hockey fan clubs but also foreign hockey fans. All agreed that there was a high level of organisation surrounding the championships. One guest noted that the ‘honesty of Belarusians’ distinguished the event from when it was held in Helsinki. 62% of viewers of the talk show voted via text message that they are sure that foreigners will again come to Belarus after the hockey championships are over. Belarus Digest prepared this overview on the basis of materials available on the web site of Belarusian State Television 1 (BT1) and ONT. Freedom of the press in Belarus remains restricted and state media convey primarily the point of view of the Belarusian authorities. 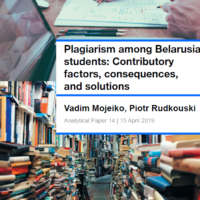 This review attempts to give the English-speaking audience a better understanding of how Belarusian state media shape public opinion in the country.